Barnsley striker Cauley Woodrow tweeted that Fleetwood manager Joey Barton confronted Barnsley manager Daniel Stendel following the game, which ended 4-2 to the home team. The tweet has since been deleted. Woodrow, who scored in his side's 4-2 victory, alleged that Barton had left Stendel with "blood pouring from his face." Barnsley said in a statement on Saturday evening: "The club can confirm there was an alleged incident in the tunnel area that took place following the conclusion of today's match, which South Yorkshire police are currently investigating. Elsewhere in League One Luton's progress at the top of the table was brought to a halt by play-off hopefuls Charlton, who beat them 3-1 at The Valey. Lyle Taylor (2) and Igor Vetokele got the goals. Sunderland lost 5-4 at home to Coventry with ex-Pompey forward Conor Chaplin scoring the winner in a remarkable game while Doncaster kept their play-off charge on track as first half goals by James Coppinger and Danny Andrew meant they beat Plymouth 2-0. 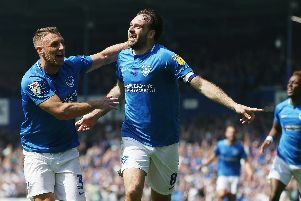 Peterborough are hanging on to Doncaster's coat-tails after a 1-0 win at Blackpool while Burton - who host Pompey on Good Friday - are ninth and in fine form, which they maintained with a 3-0 win at Scunthorpe. Kieran Wallace. Lucas Akins and Liam Boyce got the goals. Shrewsbury moved well away from the bottom four, in places at least, with a 2-0 win at Gillingham, as did Bristol Rovers, whose 3-2 home win against Bradford leaves the Bantams highly unlikely to survive. In amassive game at the bottom Accrington triumphed 2-1 at home to Walsall, who are now second from bottom. With them in the bottom four are Southend, who went down 2-0 to Wycombe, and AFC Wimbledon, who could only draw 0-0 at Oxford.